With Singapore's Changi airport voted as the best place for unexpected stopovers, TripExtras looks at how to deal with the pitfalls of being stranded. Some of those surveyed managed to spend their stranded time in the comfort of a VIP airport lounge, something which really comes into its own during stopovers and delays. If being stranded by unexpected delays is going to happen anywhere in the world, then the best place for it is Singapore's Changi airport according to a recent survey. A huge 32% of the 1,000 IAPA members surveyed said it was by far the best airport for delayed passengers. Other favourites were Amsterdam Schiphol, Hong Kong International and Dubai International. London Heathrow, however, found itself topping both the best and worst lists as the most popular choice as the worlds worst airport in which to be stranded. Other undesirable airports were Paris CDG, Miami International, New York JFK and Mumbai International. Poor facilities and services was a top frustration of being stranded, with 21% of responders citing this as their top annoyance. And it was Singapore's opportunities for entertainment during an unexpected stopover that made it stand out as an airport not to get bored in. Some of those surveyed managed to spend their stranded time in the comfort of a VIP airport lounge, something which really comes into its own during stopovers - especially when hordes of passengers are crowding the terminal due to delays. "Few people realise they can book into airport lounges when they fly economy, but for stopovers between flights and delays they are a little known gem", says James Berry, Director of TripExtras. 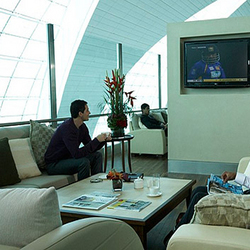 "Our bookings for airport lounges in destinations such as Singapore, Dubai and Doha are increasing in popularity as more holiday makers discover the secret of being able to book into an airport lounge without having to fly first class".